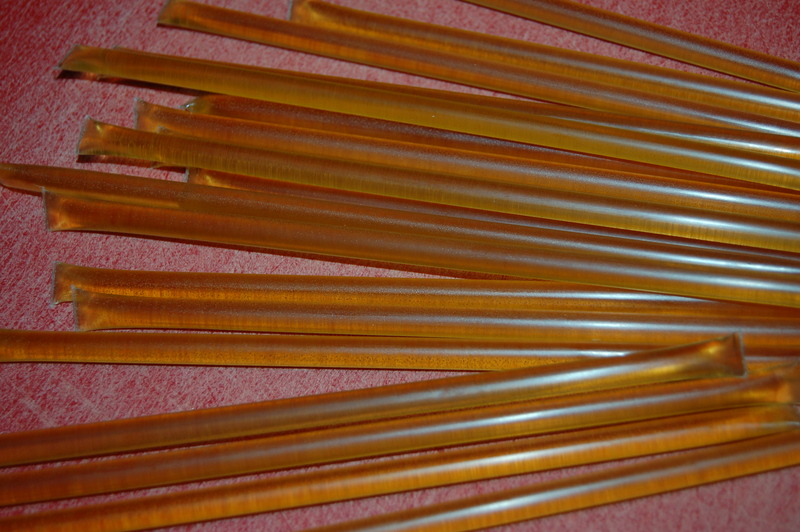 Glorious Honey Sticks! | Crappy Kitchen - Good Dinners! ← Light Chicken Ragu with Shells (serves 6) And a Word on Economy! 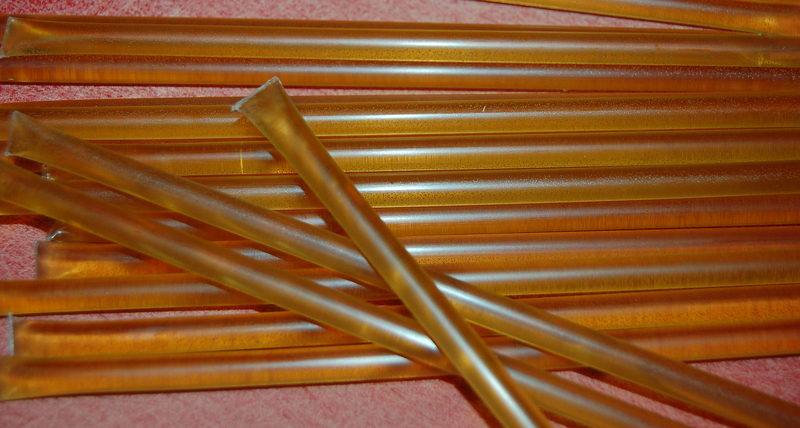 I can’t believe I want to write about these little novelty straws full of honey – but I simply have to! I first spotted these vials of sweet yellow honey sticking upright in jars at my local Health food shop. You know how shops put sweets at the checkout luring you to buy something while you wait your turn? Apparently this marketing strategy has not been lost on the lady who also advises me on which tincture of this or that I should buy for my immune system or which probiotic is essential for my general well-being. Even in this little shop there can sometimes be a wait while people get engrossed in pumping anyone who will listen to them about their ailments and what can be done about them! This results in my kids, who are invariably by my side, having time to get fixated on something and then start begging for it (in the nicest possible begging voice I might add). I give in when I’m in the mood and it is the Honey Stick that wins out over all else every time. I never saw the appeal or the harm in indulging them so I have been buying them the various varieties on offer at the counter for a number of years now. This company not only sell pure clover honey sticks but also lemon honey sticks, agave nectar sticks, cinnamon honey stick, even chai honey sticks! A couple of weeks ago however I found a whole box of them, tucked away on a shelf I don’t usually have the patience to throughly investigate. I was actually looking for a jar of local honey for my new-found passion for chamomile tea when I spotted them. They were lined in a neat row in a box and it surprised me. I don’t know why since the owner has probably been breaking up boxes and selling them individually for years! I felt like I had found a treasure and I couldn’t wait to show them to my kids. It is a silly thing really, but I never felt right about buying a whole bunch of them up at the counter, whereas buying a box of them seemed sensible. I have to say that I am now in love with honey sticks. They are great to take the edge off a sweet tooth moment, and I pack them as “dessert” in the school lunch boxes. It is a very small treat ( not more than a baby teaspoonful and 15 calories) but my sweet innocent children think I am giving them special treatment. I asked them why they liked honey from a plastic straw so much and the answer is simple if you are a child, “they are sweet and gooey and are fun to eat” There you have it, although I’ve now began to pop one or two in my bag, and anywhere I have chamomile tea and there is only sugar on offer, that little honey stick comes in handy! Yes I know I am sounding like some nerdy lady who carries absolutely every emergency in her bag but I swear I am not. I wish I were as there is no moment more triumphant than pulling something out of your purse when someone is in dire need. Have you every wanted a band-aid, a pencil (not a pen! ), a cough drop or even a Q-tip and wished that nerdy woman was around to give it to you? 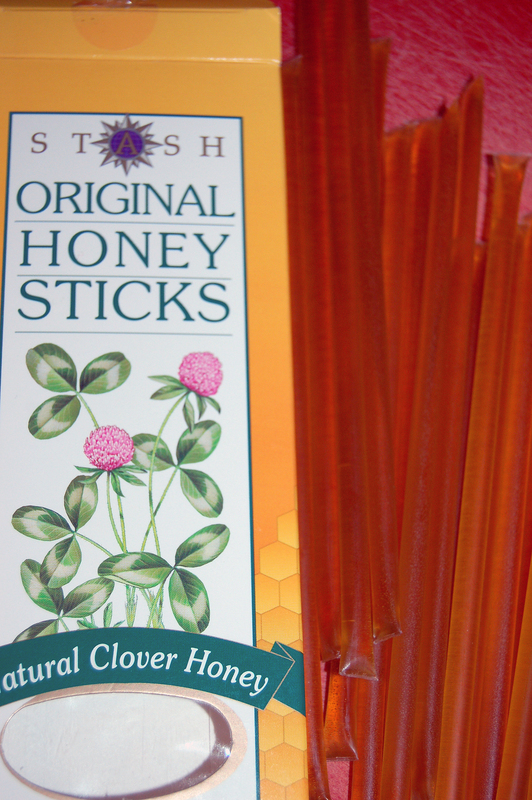 Now at least I have honey sticks – how many of you can say that! This entry was posted in pantry, Stuff I like and tagged agave nectar sticks, clover honey, dessert, health food shop, honey, honey stick, honey sticks, Stash tea, sweetener, tea sweetener. Bookmark the permalink.